FILE - Former Japanese Prime Minister Yasuhiro Nakasone delivers a speech during the annual meeting on Japan's constitution reform in Tokyo, May 1, 2015. It is somehow fitting in a country known for longevity that one of Japan's most prominent former leaders has reached 100 years of age. As a World War II naval officer, Yasuhiro Nakasone witnessed the depths of his country's utter defeat and devastation. Four decades later, he presided over Japan in the 1980s at the pinnacle of its economic success. In recent years, he has lobbied for revision of the war-renouncing, U.S.-drafted constitution, a longtime cause that neither he nor any successor has achieved to date. "I feel blissful that I was able to stand up and work with the Japanese people for Japan's reconstruction [from war devastation]," Nakasone said in a statement to mark his birthday Sunday. "As I reflect on 100 years of my life with the changing times, many memories pass through my mind and emotions fill up my chest." Nakasone, who is cared for by his 71-year-old daughter at their Tokyo home, is slowing down but is in fine health, his aide Masaki Donji said. He skipped his annual speech at a May rally in support of constitutional revision, because he had broken his right hand and couldn't use his cane to get up from his wheelchair. Still, he checks newspapers every morning and reads books, and sometimes drops by his office, escorted by his family. "Endless hunger for exploration and intellectual curiosity is crucial," Nakasone says. The son of a lumber merchant, Nakasone was born May 27, 1918, the last year of World War I. He went to Tokyo Imperial University before entering the navy, where he rose to lieutenant commander during World War II. He began his political career as a fiery nationalist denouncing the U.S. occupation, which lasted from 1945 to 1952. He was a driving force in the 1950s behind building nuclear reactors in resource-poor Japan, a move that helped propel the nation's postwar economic growth and recovery. 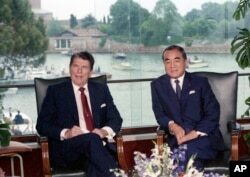 FILE - American President Ronald Reagand, left, and Japanese Prime Minister Yasuhiro Nakasone during their meeting at the Cipriani Hotel, in Venice, Italy, June 8, 1987. During more than a half-century in parliament, he served as defense chief and head of the powerful Ministry of International Trade and Industry. As prime minister from 1982 to 1987, he strengthened Japan's defense and alliance with the U.S. while tackling vested interests to launch the privatization of the state telephone, tobacco and railway companies. He was also known for his warm "Ron-Yasu" relationship with former President Ronald Reagan, who himself lived until the age of 93. Nakasone's nationalist legacy includes the first official visit by a postwar prime minister to Yasukuni shrine, which honors Japan's war dead, including convicted war criminals. His visit fueled disputes with China and South Korea over World War II history that persist to this day. Both nationalist and wrestling with the same issues - stronger military, constitutional revision and even trade friction with the U.S. - Prime Minister Shinzo Abe has been compared to Nakasone by some Japanese media and analysts. But the Japan that Abe leads today is no longer at its peak and China is now a rival to the U.S., prompting Abe to be more hawkish toward Beijing's aspirations. "The important difference between these two leaders is that Nakasone experienced the war, the real battlegrounds, and saw his buddies killed," said Hiro Aida, an international politics professor at Aoyama Gakuin University in Tokyo. "This brought some intrinsic humbleness to Nakasone, though he often looks haughty." Nakasone is not the first ex-Japanese leader to reach 100; Prince Naruhiko Higashikuni, the prime minister for 54 days immediately after World War II, lived to be 102. Japan is home to more than 67,000 centenarians, including the world's oldest person, a 117-year-old woman. Nakasone says he is not done yet. "I am determined to devote myself to my last service for the country, for the people and for my hometown," he said. While it still has life.